Siddhartha Resort offers you the luxury of a Boutique-Hotel with stunning architecture in a fabulous setting. The resort is situated directly on the beach in the small village of Kubu on Bali’s north-east coast, far from all the commercial tourism. Siddhartha’s bungalows and villas blend in perfectly with the surrounding terraced landscape – a stunningly beautiful tropical garden created around the existing palm trees and natural vegetation. There is more than 180 metres of beachfront and almost all of the bungalows have an ocean view, thanks to the slightly sloping landscape. Bali’s most holy mountain, the imposing ‘Mount Agung’, towers in the background and there is an incredible view of the sea from the large infinity swimming pool. Siddhartha Resort is home to a Werner Lau dive centre and diving takes place on both the house reef and at the nearby sites of Tulamben, such as the USS Liberty shipwreck. Superior Bungalows have a living area of 45m2 including a large terrace equipped with teak sunbeds and your own personal towels. 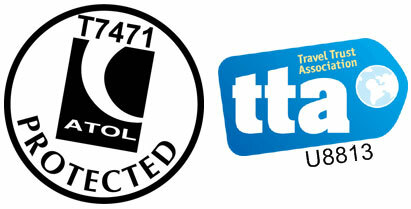 The bungalows are all light with modern furnishings and all have double beds. 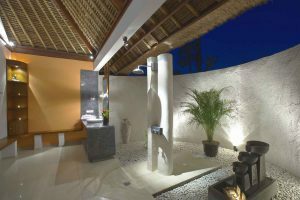 All of the luxurious bathrooms are made of natural stone with two showers, a rainfall shower and a waterfall shower. The bathrooms are partly open, so you can enjoy your own secluded shower beneath a starry sky listening to the birds and the cicadas. Superior Bungalow facilities include air conditioner, electric fan, safe, minibar, telephone, tea/coffee making facilities, hair dryer and WLAN connection. Deluxe Bungalows have a living area of 55m2 including a spacious terrace equipped with teak sunbeds and your own personal towels. 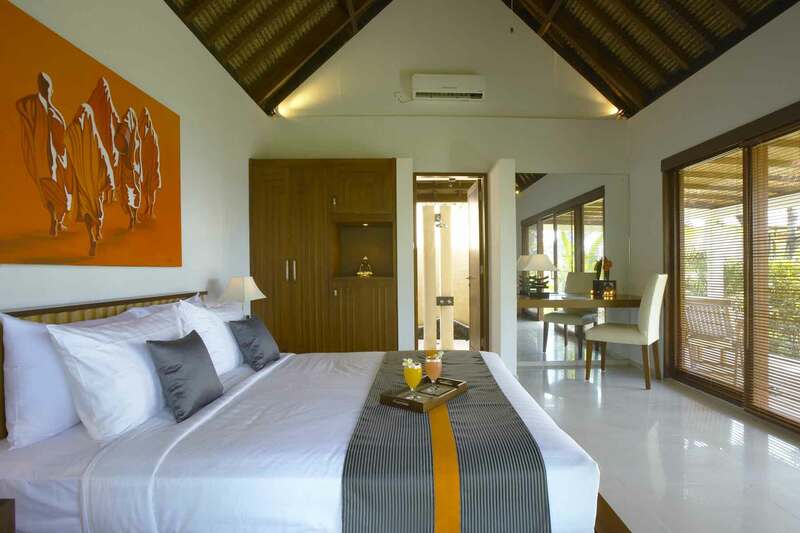 The bungalows are all light with modern furnishings and all include an additional day bed. All of the luxurious bathrooms are made of natural stone with two showers, a rainfall shower and a waterfall shower. The bathrooms are partly open, so you can enjoy your own secluded shower beneath a starry sky listening to the birds and the cicadas. Deluxe Bungalow facilities include air conditioner, electric fan, safe, minibar, telephone, tea/coffee making facilities, hair dryer and WLAN connection. 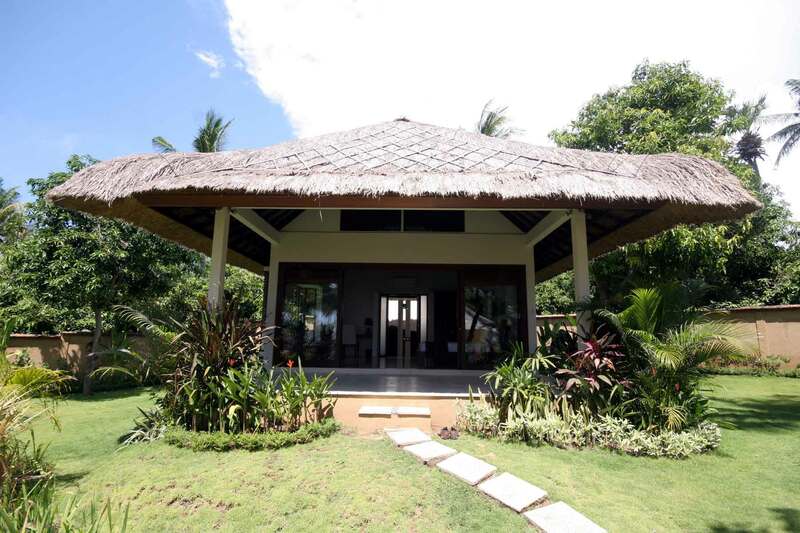 Ocean Front Deluxe Bungalows directly overlook the ocean with a living area of 65m2 including a spacious terrace equipped with teak sunbeds and your own personal towels. 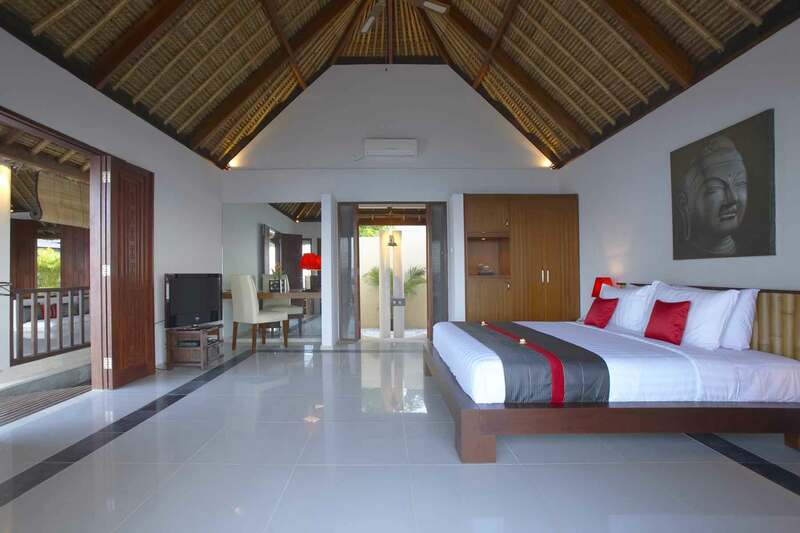 The bungalows are all light with modern furnishing, additional day bed and a king size bed facing the ocean. The luxurious, semi-circular and spacious bathrooms are made of natural stone with two showers, a rainfall shower and a waterfall shower. The bathrooms are partly open, so you can enjoy your own secluded shower beneath a starry sky listening to the birds and the cicadas. 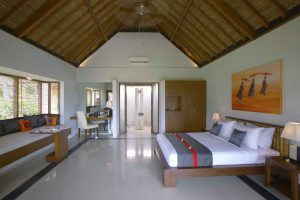 Ocean Front Deluxe Bungalow facilities include air conditioner, electric fan, safe, TV/DVD & stereo set, minibar, telephone, tea/coffee making facilities, hair dryer and WLAN connection. 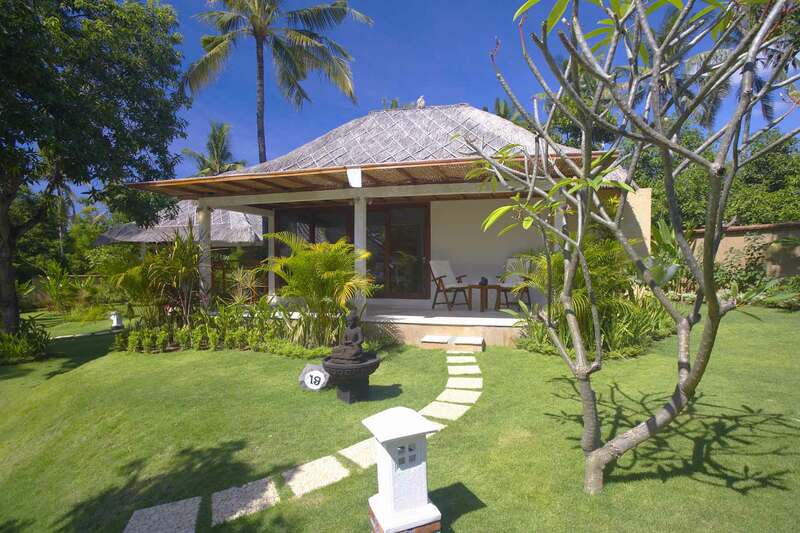 Santai and Pantai Villas are nestled in a private garden, directly above the ocean with private pools! These two dream villas each have their own gigantic terrace and two separate bedrooms with en-suites. Separated by the main area, where you will find the living room and kitchen. These bungalows are luxuriously furnished and are modern, yet comfortable. 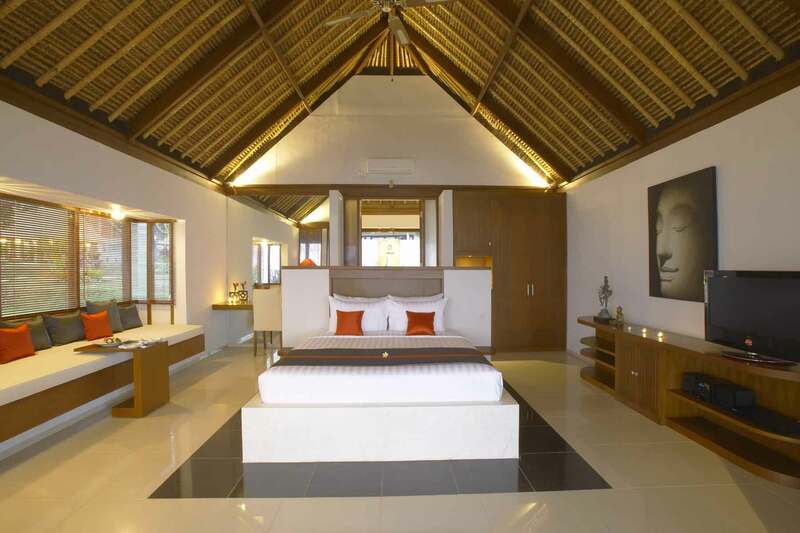 Furnished in traditional Balinese style your relaxation is guaranteed in these harmonious settings. 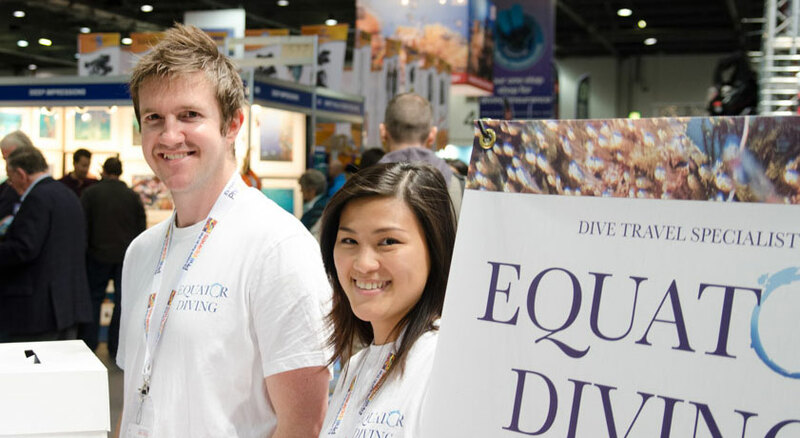 Regardless if you are travelling as a couple or a group of four, this is truly a dream come true. Villa facilities include air conditioner, electric fan, minibar, telephone, hot and cold water, tea/coffee making area, Satellite TV, DVD and stereo and a safe. Upon request you can have your breakfasts prepared in your villa.